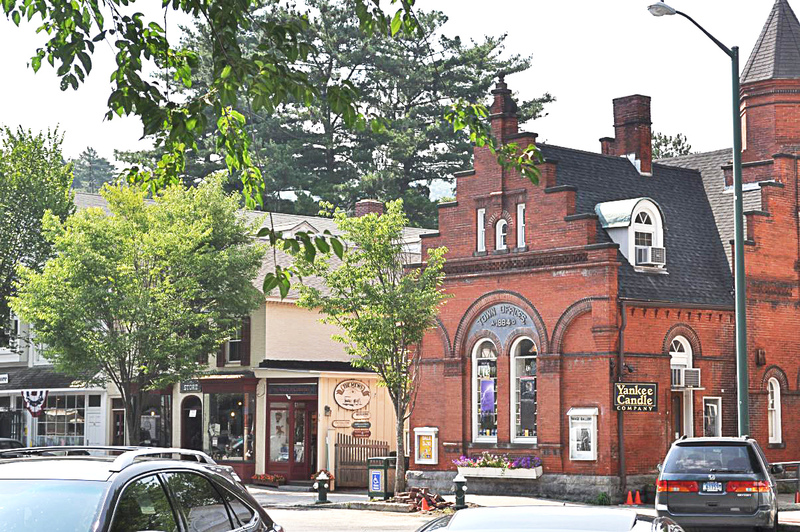 The Stockbridge area is blessed with a line-up of cultural attractions that rivals that of many metropolitan areas: internationally renowned summer festivals of music, theatre, and dance; major art museums and galleries, and historic homes and gardens. The spectacular Berkshire countryside that provides a backdrop for the cultural showcase is itself a destination, with numerous trails and back roads for hiking, cycling, bird watching, cross country skiing and snowshoeing. Guided tours and local train rides are offered during the summer season. We have mapped out a route that samples our history, culture, vistas, and leisurely shopping. Start at the town’s crossroads, Main and South Street (Route 7), as travelers have done for hundreds of years. Set in the triangular park at the center of the crossroads is one of Stockbridge’s public landmarks, the 1862 Cat and Dog Fountain. To the right (east) of the fountain sits the famed Red Lion Inn, founded as the Inn at the Sign of The Red Lion in 1773 (along with the sign of King George III). Originally the inn was a stagecoach stop and pre-Revolutionary meeting place. Today, its famous front porch beckons visitors to sit, sip and people watch. Among well-known personages who have stayed at the inn are Presidents Grover Cleveland, William McKinley, and Calvin Coolidge, as well as Nathanial Hawthorne, William Cullen Bryant, Henry Wadsworth Longfellow, John Wayne, Bob Dylan, and Garrison Keillor. Heading east from The Red Lion, you will pass by many historic buildings. The interior of the 1884 House, the original Stockbridge Town Offices, was captured by Norman Rockwell in The Marriage License. Be sure to explore the Mews, a Main Street cul-de-sac of shops, and its neighboring byway, which marks the spot of the original Alice’s Restaurant of Arlo Guthrie fame. At the corner of Main and Elm stands the Stockbridge Library. 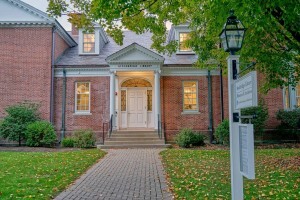 One of the oldest libraries in Western Massachusetts, it houses the Historical Room, a museum and research center containing artifacts from town residents, including the original inhabitants, the Mahican Indians. Hours: Tues.-Fri. 9 am to 5 pm; Sat. 9 am to 2 pm; Tues. and Fri. evenings open to 9 pm. For more information, call (413) 298-5501. The 1881 Watering Trough, another Stockbridge landmark, rests at the corner of Main and Elm. This working fountain features the homilies, “Utility is preferable to grandeur” and “Merciful man is kind to his beast.” On Main Street, just down from the intersection with Elm Street, is the old Plain School, recently renovated as the new Town Hall. The police station is also housed here, as are public restrooms. Returning to Elm Street, you’ll notice shops, restaurants, and an 1862 red and white firehouse. Memorialized by Norman Rockwell in his work The New American LaFrance Is Here!, Hose House No. 1 is now owned by The Red Lion Inn. The impressive 1862 St. Joseph’s Church is at the left corner. From the end of Elm, turn right onto Maple, and then turn right again onto South Street, passing Country Curtains at The Red Lion Inn, and cross Main. You will be on Pine Street at the site of the Soldier’s Monument dedicated to local citizens who died in the “Great War of Rebellion.” More than 3,000 people attended its dedication in 1866. At that corner, the 1884 St. Paul’s Episcopal Church features a chancel window by LaFarge, a baptistery by Louis St. Gaudens, and a nave window by Tiffany. The view of Main Street from this side was made famous by Norman Rockwell’s painting of the village during the holidays Stockbridge Main Street at Christmas. 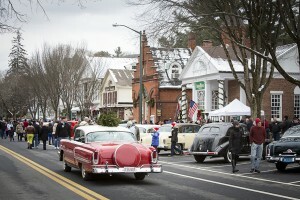 Every year on the first weekend in December, the town holds a holiday celebration offering a full range of activities, with highlights including a house tour, caroling, concert and Main Street recreation of the scene depicted in the painting complete with vintage automobiles. For details call 298-5200 or view the “Stockbridge Main Street at Christmas” page on our website. Go west on Main Street, toward some beautiful “cottages” built by wealthy industrialists as summer mansions during the opulent Gilded Age. 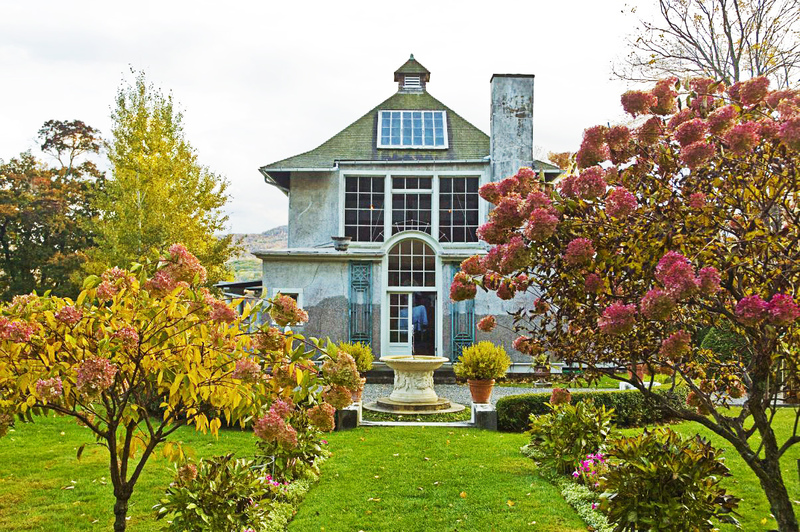 In the heyday of this “inland Newport,” as it was called, more than 100 cottages dotted the surrounding landscape, as the well-to-do escaped the heat and hubbub of the city for summer in the country. At the corner of Main and Sergeant Streets stands the Mission House, built in 1739 (the year Stockbridge was incorporated) by Rev. John Sergeant, the first missionary to the Mahican Indians. 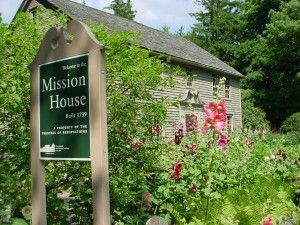 Originally located on Eden Hill, the Mission House was moved to its Main Street site in the 1920s, restored, furnished with authentic period pieces, and opened as a museum in 1930. Open daily Memorial Day weekend to Columbus Day 10 am to 5 pm. Admission fee. For more information, call (413) 298-3239. Continuing west on Main Street, you will discover the historic Stockbridge Cemetery with its Sedgwick Pie, the ancestral plot of one of Stockbridge’s oldest families. Also buried in the cemetery are several members of another well-known Stockbridge family, the Fields. Perhaps the best known today is Cyrus West Field, who was the first to lay a trans-Atlantic cable, in 1866, which revolutionized communications between Europe and America. Norman Rockwell is here, buried between his second and third wives, Mary and Molly, as are thirty-eight soldiers from the Revolutionary War. Cross Main Street to the 19th century Village Green. The historic Greek Revival building was for years the site of the annual Town Meeting, a local government tradition since 1739. The Village Green also hosts the 1824 Congregational Church. The church was first organized in 1734 by John Sergeant, who was succeeded as minister by Jonathan Edwards, known for his fire-and brimstone sermons and for helping to lead the “Great Awakening” of religious thought and belief in the mid 1700s. Also on the Green are the town’s additional war memorials, and the Children’s Chime Tower, dedicated in 1878 and rung at 5:30 every evening between “apple blossom time and the first frost on the pumpkin, (now Memorial Day through Labor Day), in accordance with the donor’s wishes. A few steps farther to the west sits the Indian burial ground monument with its obelisk of stone hewn from the nearby Ice Glen. As you stroll back down Main Street toward the center of town you will pass several Berkshire cottages, including the Merwin House, also known as “Tranquility,” an 1820s Federal-style home and grounds maintained by the Society for the Preservation of New England Antiquities, and the Sedgwick mansion built in 1875. You may wish to reach the following sites by car, although bicycling and walking are recommended for the hearty. Traveling east on Main Street about half a mile from The Red Lion Inn is the Berkshire Theatre Festival, one of the oldest, most prestigious theaters in the country. The BTF building was designed by Stanford White in 1888 as the Stockbridge Casino. Noted actors, directors, designers, and playwrights present classic and contemporary works throughout BTF’s June-September season. The 100-seat Unicorn Theatre, dedicated to the development of leadership through its directors’ initiative, and the outdoor Children’s Theatre play additional roles at the BTF. For play schedules and ticket information, call (413) 298-5536; Box Office, (413) 298-5576. Traveling west from the town of Stockbridge, turn right at the cemetery, follow Route 102 (Church Street) to the Berkshire Botanical Garden (at the flashing amber light). Fifteen acres of landscaped gardens, terraced vegetable gardens, herb and pond gardens, woodland walks, and picnicking offer visitors inspiration and relaxation. Events abound throughout the season, including the historic Harvest Festival held the first weekend in October. Hours: May- October, 10 a.m. to 5 p.m. Admission fee. Group tours by reservation. (413) 298-3926. At the intersection of Main and Pine Streets in Stockbridge, go north on Pine Street. The Marian Fathers’ property, Eden Hill, is at the top of the hill. It is the home of the National Shrine of the Divine Mercy, the Association of Marion Helpers, and the John Paul II Institute of Divine Mercy. The extensive grounds and national shrine are open to the public. For information, call (413) 298-3691. Veer left from Pine Street up Prospect Hill for a glimpse of grand cottages and farmsteads. 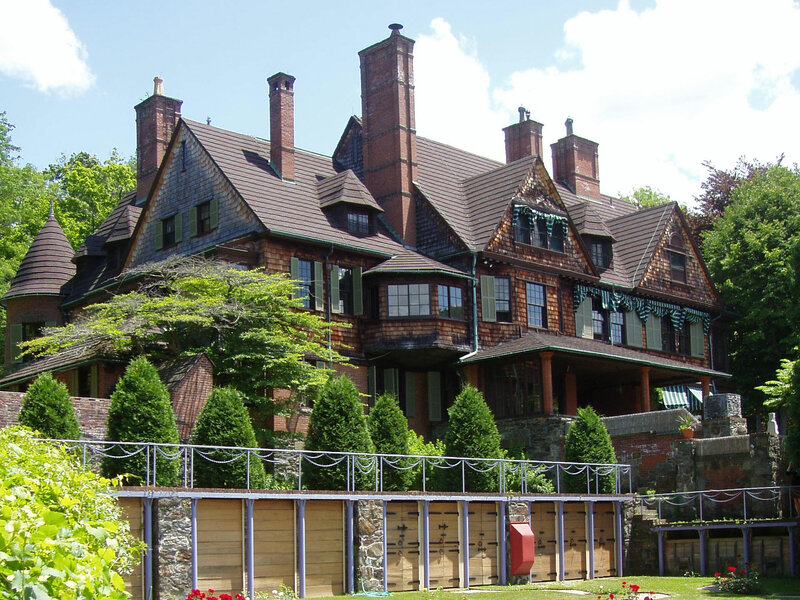 Naumkeag, designed by Stanford White, is one of a few Berkshire cottages open to the public. Built in 1885 for Joseph Choate, a prominent New York City attorney and later ambassador to Great Britain, the home, furnishings and collections draw the visitor into the Gilded Age. The lush gardens were designed by Choate’s daughter Mabel, with the aid of noted landscape architect Fletcher Steele. 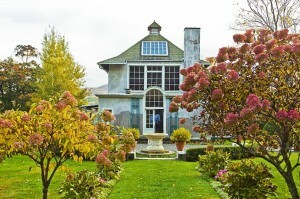 The Trustees of Reservations, established in 1891 as the country’s first independent organization for the preservation of landscape and historic sites, oversees Naumkeag, the Mission House, and Monument Mountain. 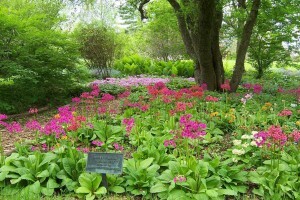 Guided house tours, walking tours of grounds, picnicking. Hours: Memorial Day weekend through Columbus Day, 10 am to 5 pm daily. Admission fee. 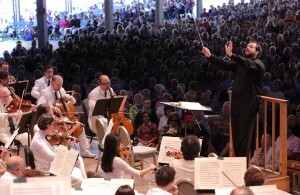 Group tours by reservation: (413) 298-3239.
eventually meanders by the Stockbridge Bowl, a mile-wide pond known for scenic autumn vistas, summer boating, swimming, fishing, and spectacular fireworks finales for the Tanglewood music season (although you are not allowed to park along the side of the road). This road also leads you past Hawthorne Cottage (The Little Red House), home of writer Nathanial Hawthorne from 1850 – 1851. Here he collected material for Tanglewood Tales and The Wonder Book, wrote The House of the Seven Gables, and crafted names that were later used by two famous sites – Shadowbrook, the largest of the cottages (now the site of Kripalu), and Tanglewood, the summer home of the Boston Symphony Orchestra. Note: In 1891, the Hawthorne Cottage was destroyed by fire. Today’s exact replica was built by the Federated Music Clubs of America in 1948. A few blocks south of Main Street discover the Ice Glen, a natural wonder ideal for hiking. Take Route 7 South, turn left at the gas station onto Park Street and park at the end of that street. A footbridge over the Housatonic River will lead you to three trails. The Mary Flynn trail is a paved walk along the river that is handicapped accessible. To reach the other two trails, cross the railroad track. In about a quarter of a mile, the trail forks. The right trail leads you into the Ice Glen, complete with glacial boulders and ice crystals even in July, the left fork takes you up to Laura’s Tower. Climb the tower for a three-state view of Mt. Everett in southern Massachusetts, the Catskills of New York, and the Green Mountains of Vermont.